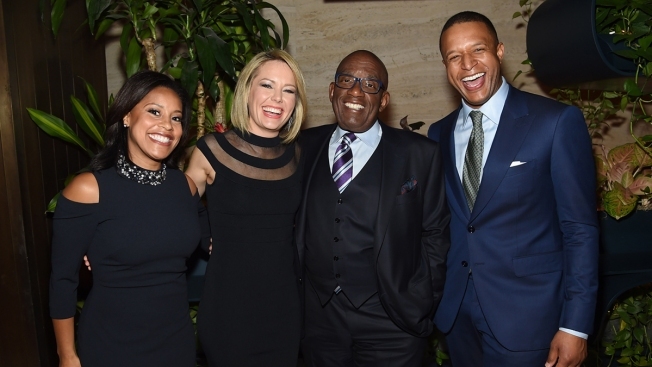 From left: Sheinelle Jones, Dylan Dreyer, Al Roker and Craig Melvin attend the Hollywood Reporter's Most Powerful People In Media 2018 at The Pool on April 12, 2018, in New York City. Less than three months after "Megyn Kelly Today" was canceled, it appears viewers now know who will replace her. On Monday morning, Dylan Dreyer revealed she will be co-hosting every weekday morning at 9 a.m. with Al Roker, Sheinelle Jones and Craig Melvin. "Hope you don't mind these faces! You'll be seeing a lot of them at 9 a.m.," she shared with her Twitter followers. "Please join us! #3rdhourtoday #youvegotafriendinus #letthegoodtimesroll @TODAYshow @SheinelleJones @craigmelvin @alroker." Al shared the same post with the message, "I love these guys." The announcement also comes as "Today" works to find a replacement for Kathie Lee Gifford once she leaves the fourth hour this April. Reports have surfaced that Jenna Bush Hager could be named the new co-host alongside Hoda Kotb, but NBC has yet to deliver any official news. "I have my idea of who might be absolutely wonderful, but there's a great pool of talent and beauty and heart around here, right within our own family," Kathie Lee explained when announcing her departure. "And if they come from outside the family they will soon become family because you all treat everybody that way..."